The ‘Global and China LED Industry Report 2009-2010’ says that the LED market has expanded from US$7 billion in 2009 to US$10.7 billion in 2010 and is expected to reach US$20.4 billion in 2012. Klaus Ploog will be talking on “What next for the Compound Semiconductor Industry?” at CS Europe Conference. The scientists say the novel laser-machining techniques can be applied to InP and CdTe based devices to achieve very high aspect ratios resulting in smaller and lighter devices. The firm has joined both the Russell 1000 & 3000 indexes which focus on objective, market capitalization and style. 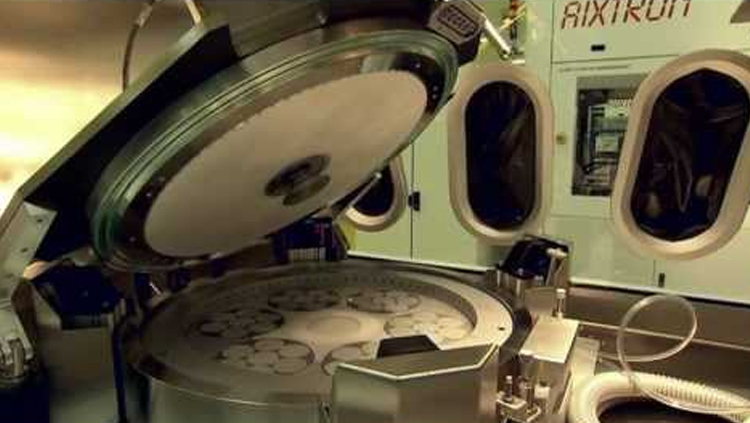 The 31 x 2” MOCVD systems increase the firm’s epiwafer capacity for GaN HB-LED production. The single-axis stages and bridge configuration are ideal for thin film photovoltaic scribing, and wafer processing. As President of the Laser and Fiber Optic groups for what is now JDSU, Ian Jenks has now been appointed as Chairman of QuantaSol. The Taiwanese firm is likely to see a monthly company high in July 2010 thanks to the new deals with Skyworks. The group will address the large-scale photovoltaic (PV) system solutions market and be headed by current CFO, Jens Meyerhoff. The MwT-LN series of three AlGaAs/InGaAs based low noise hybrid pHEMT devices operate in the wideband and narrow band ranges of up to 38 GHz. Infineon and OSRAM both champion the cause of sustainable development and environmental protection. In collaboration with the OSRAM partner network LED Light for you, the German company Diana Electronic Systems has developed an energy-efficient LED lamp for the Global Nature Fund to be used in Sri Lanka. Local fishermen will use the lamps instead of their environmentally harmful kerosene lamps when fishing at night. Avago Technologies, Finisar Corporation, Opnext, Inc. and Sumitomo Electric Industries, Ltd. today announced that Revision 1.4 of the CFP Multi-Source Agreement (MSA) hardware and firmware specification documents is now available on the CFP MSA website at: www.cfp-msa.org. In addition, the three companies, which founded the CFP MSA and first announced it in March 2009, welcome Avago Technologies as a new member. High efficient LEDs from DOMINANT Opto Technologies are upgrading the exterior illumination of Haima’s first SUV. RoseStreet Labs Energy, announced today a breakthrough laboratory demonstration of the first known multiband photovoltaic device featuring three distinct light absorption regions integrated into a single layer thin film device. IQE, supplier of advanced semiconductor wafer services for the Wireless, Optoelectronic, Solar, and Solid-State Lighting industries announces the appointment of Adrian Meldrum to the board of IQE as Business Development Director. RF Micro Devices, a global designer and manufacturer of high-performance radio frequency components and compound semiconductor technologies, today announced the availability of the RF3482 front end module (FEM). RFMD's highly integrated RF3482 single-chip FEM integrates a WiFi power amplifier with a single-pole, three-throw (SP3T) switch for 2.4 GHz to 2.5 Ghz ISM band applications.